What do weddings, Bob Marley, and Les Miserábles all have in common? The music of all three feature the classical musician’s favorite tune (or favorite tune to hate), Pachelbel’s Canon in D. Whether you love it or hate it, Pachelbel’s Canon is one of the most famous and most recognizable pieces of classical music today. To celebrate National One Hit Wonder Day, there is no artist better to look at than Pachelbel; while his canon is his only truly famous work, the tune has been featured in music across a dizzying array of genres. While it may seem that classical musicians will never escape the grasp of Pachelbel’s canon, the piece did not become popularized until the 1970’s when French conductor Jean-François Paillard made a recording that launched the piece into mainstream classical music. Before that, not much is known about the origins of Pachelbel’s piece aside from the general time it was written in the 1680’s. When writing, Pachelbel used a compositional form called canon, a counterpoint-based technique, in which an initial melody, the leader, is repeated at a specific interval by one or more parts at a different pitch, known as the followers. Examples of canon include Row, Row, Row Your Boat, or more similarly to Pachelbel, Frére Jacques. You may find the chord progression familiar if you are a fan of works like Bob Marley’s “No Woman No Cry,”, Aerosmith’s “Cryin’,” Avril Lavigne’s “Sk8r Boi,” or the musical Les Miserábles, in which 15 songs directly utilize Pachelbel’s canon. 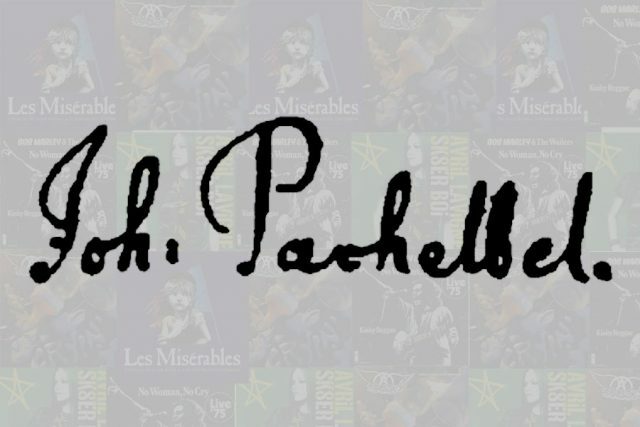 Les Mis demonstrates the variety of ways Pachelbel’s canon can be used in music- to see for yourself, this video plays Pachelbel’s Canon in D and then overlays the melody of famous songs from Les Miserábles to demonstrate the similarities. To satirize just how often musicians use Pachelbel’s canon, intentionally or unintentionally, in music, comedian and composer Rainer Hersch conducts a medley highlighting the diverse multitude of songs that use Pachelbel’s canon demonstrating how through genres and years musicians routinely return to Pachelbel’s one hit wonder.